TWPT: Tell me about how you came to be on the spiritual path that you are on now. AM: Well, obviously I was a massively important witch in all my past lives and in this current incarnation I was recognised immediately and initiated as a child by my hereditary witch family into a special and ancient tradition, having also been born the seventh son of a seventh son. . err . . . ok, so I’m joking, I hope that’s obvious because I've heard much crazier claims down the years! The truth (which I believe is the highest religion there is) is perhaps a familiar one to many Pagans - having attended church as a boy I came to realise it wasn't for me, Sundays seemed to be days to spend out and about in the fresh air, exploring, adventuring, fishing, tree climbing or whatever and I felt a spiritual pull to nature, I thought "If there is a deity, it's out here and it's eternal, not stuck in a stone building and only accessible once a week". I started reading books, discovered “the occult" and had a few foolhardy experimental experiences, which convinced me of the world of spirits, energies and forces that exists behind the world of physical form. Spiritually I've always been rather adventurous and eclectic and I kind of forged a (well read and informed) path of my own but after a few years I came to realise that the Craft sort of held a special appeal and magic for me, it called to me and it seemed the closest to my own ideas and just then, as if by magic (!) the right teachers appeared . . . so while I am a "proper" initiate, with all that entails, I still feel very free indeed to keep on adventuring and exploring my spirituality, as a friend of mine puts it, it's a wonderful landscape where terrible things can happen! TWPT: What is the Pagan Federation all about and what principles and goals does it have to guide it along? AM: The Pagan Federation was born in the early seventies from a couple of other organisations, a group of Pagans which included Doreen Valiente felt that Paganism was receiving unfairly bad press, there had been a number of newspaper scandals and they wanted to form a body that could lobby not just the authorities but perhaps the wider community for acceptance of Pagan ideals, spiritual principles and religions. It became an umbrella body really, a place of contact for those seeking Pagan paths and when I came on the scene as a young adult it was almost the only way to make contact with others of a like mind, there was no internet and it was still culturally not completely acceptable, you wouldn’t tell your employer you were pagan for example, so if you wanted to find out what was happening in your area the PF was the place to go. 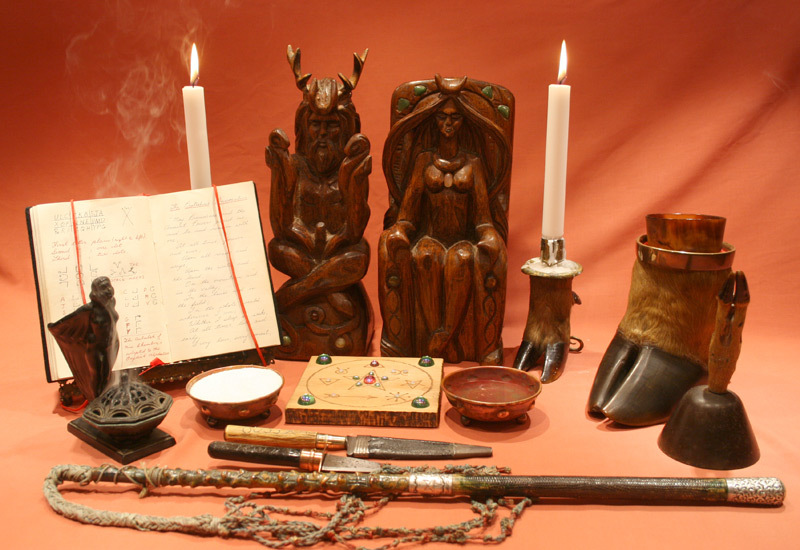 These days it's viewed as authoritative by the "powers of government" but has to deal with the fact that in the UK its membership is now only a proportion of the pagan population. I believe it still has an important role to play in providing an interface between pagans and non-Pagans, individually and collectively and the Doreen Valiente Foundation supports the PF in its initiatives to drive better understanding in the wider community, we are working on some projects together and its quite exciting stuff for the future. TWPT: What role do you play in the PF? AM: Officially I'm only involved on a local level, I just maintain the website for the local PF really but I've been a spokesperson for the PF jointly with the other organisations I represent doing interviews on the radio, TV, magazines etc. I've also given talks in schools, local church groups and for various organisations concerned with religious diversity like the regional ambulance service and even once in a hospice for elderly and terminally ill people. Really I'm a bit of hybrid, I have to wear several hats depending on who I'm representing on the day but this seems to suit both the DVF, the Centre For Pagan Studies and the PF whose current president, Mike Stygal, is bringing new ideas to the PF and to the pagan community and he’s very encouraging of folks like me saying sensible and accurate things to the media regardless of who I'm officially representing. TWPT: Could you give me a rundown on what the blue plaques are and what they signify to those who live in the UK? AM: A Blue Plaque is a marker in honour of a person who made a great achievement in their field. There are a number of Blue Plaque organisations but mostly the plaques are granted and put up by local authorities. Anyone who made a significant contribution to the wider public community can receive one so great politicians, great inventors, great authors etc. 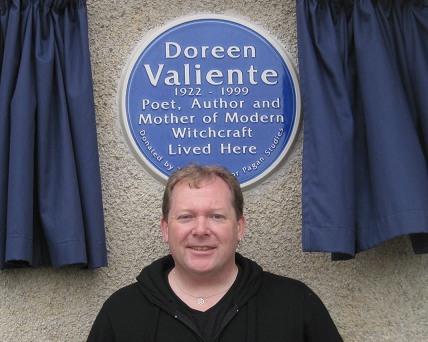 TWPT: The first blue plaque that you were involved with was for Doreen Valiente. Give me a little background on how it started and what kind of effort it took to make it a reality. AM: Doreen's plaque was difficult, not just because it was the first one we'd done but because Brighton has a long history of being home to creative people who achieved great things. When we approached the council we were delighted to find (after some research) that they approved the idea of a Witch/ Pagan having a plaque for achievements in their field, they knew who Doreen was and had an appreciation of what she’d done but we were daunted to learn that when Doreen went on their Blue Plaque list it was already so long that we were told it wouldn’t become due to be put up for about 20 years! With a lot of wrangling and meetings and discussions they finally conceded that if we raised the funds ourselves to make the plaque, put it up and host the unveiling ceremony, we could jump the queue so we set about raising funds. The Plaque itself costs about 1500 pounds, with all the rest of the costs for mounting it on the wall, hiring the equipment, putting on the event etc. we were looking at about 4000 pounds. Then we had the complication of Doreen's residence being in a block of residential flats owned by the council. We had to start talks with a different part of the council for permission to put the plaque on a public building and we also had to start talking to the building's other residents. Luckily Doreen had been on the committee for the residents association and was well loved and remembered by some of them so eventually we got the green light from everyone and were delighted to discover that not only would the plaque be the first for a Pagan but the building would be the first council residential property ever to have a blue plaque too. This gave us the final media push we needed, we got national TV and newspaper coverage and it helped us raise the final funds to put the unveiling event on (when you have local dignitaries like the mayor etc. involved and there are going to be press and TV there it all suddenly becomes that bit more fraught… and expensive! But we did it, there is video footage on YouTube of the unveiling and the whole historic event with speeches and dignitaries and all and it’s there for all to see and enjoy forever. Can’t quite believe still that we made history that day, it makes me excited all over again just to think about it! TWPT: What does this kind of recognition for Doreen Valiente mean to the wider Wiccan/Pagan community both in the UK and around the world? AM: I think it’s a symbolic thing, but as we know magically, symbols are very important. I think modern Paganism as a whole is realising that if it aspires to be treated on equal terms with other faiths and sections of the community it has to start to behave on equal terms, like a child starting to assert themselves it really has to grow up a bit. I think we've rather enjoyed sitting at the fringes of society and rather revelled in being considered "unusual" and we have to sacrifice some of that if we want to be included in “the mainstream”. I'm very aware that being included isn't what every pagan wants, certainly I think most want acceptance and it "feels" (at least in the UK) that this is generally what we are moving towards so we have to set up interfaces with the rest of our society which both sides can handle. It's an extension of the PF's fundamental aims really and symbolic stuff like blue plaques certainly add to that, not to mention the positive press and media coverage which paints paganism in the "right" light, it shows the world that Witchcraft is a perfectly "normal" (acceptable?) field to achieve in and that message permeates through the readers/viewers so that next time they meet someone who says "Actually I'm a Witch" it is something they find familiar and not "out of the comfort zone". In my mind this is how we, as human being, integrate . . . and it works. TWPT: Gerald Gardner was the next to get the Blue Plaque treatment so tell me about the process of selecting Gerald as the next recipient and whether the whole process was a little easier for having gone through the process the first time for Doreen Valiente. AM: I think Gerald was a fairly obvious contender really, some may say we should have done Gerald’s plaque first really. The process was easier because the place we chose (Gerald has several homes) is still, as it was when Gerald lived there - a private house so once the owners were "on board" it was plain sailing. The owners knew nothing about their house’s history until local historian Ian Stevenson approached the estate agents who sold the house and they put him in touch with the owners. They got right behind the thing and were excited that a famous person once lived in their house, all the more exciting to them that Gerald was famous for being a Witch (see how acceptability of Witchcraft etc. permeates society?) 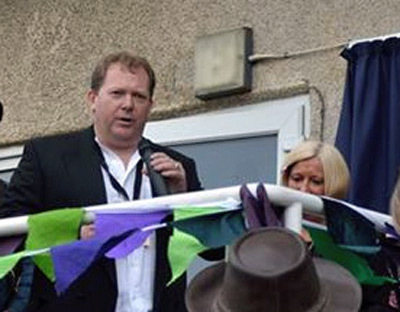 After that the local council (different council from Brighton) were relatively easy, they approved the plaque and sent dignitaries to the event in good faith and great spirit. So yes, the process was "easier" but we're still trying to figure out if that's because the circumstances were just different or if it was because we got better at it after our experience with Doreen’s plaque! TWPT: Tell me about the significance of remembering the past and those leaders who founded the modern day Wiccan movement in the UK in other parts of the globe. AM: Well, the thing is, new followers of any "movement" don't always immediately know about their "ancestors" and their heritage and they are naturally curious, well, the serious ones are… and the others should be (!) so there's a kind of duty upon the movement to pass on the story to the new generation (fitting I think because this is also how the art of magic and the beliefs and practices in most pagan traditions are also passed down). The interesting thing is that, as many authors have said, Wicca grew from an underground cult to a worldwide religion in just a few decades and this is really remarkable - most cults explode onto the scene with a brief but bright flare then sink back to obscurity really quickly. My own theory on why Wicca (or The Wica, as Gerald called it) didn't do so is that Gerald wasn't like other cult "leaders". No one was worshipping at the feet of the great sage, Gerald had his flaws and foibles and this made him more human . . .and less likely to get into pedestals and egos which is one of the major contributing factors (in my view) to why cults normally fail. I think also the timing was right; it tapped into a current already moving in society (and who's to say that this isn't more than coincidence and is in fact universal forces at work?). We're only 70 years in, really, we're just seeing the end of the period of living memory, the time equivalent to that of the writing of the gospels (if you'll allow me to draw a parallel with a certain other world religion which grew from a small cult) and we are getting into the second round of historians and commentators who don't have first hand witness evidence but who DO have a (possibly) more objective view of things and its really important that we make use of this brief crossover period to gather up the first hand witness accounts and write about them more objectively while we still can. To draw the parallel again, Jesus wasn't a Christian (he was a Jew) and so Gerald wasn't a Gardnerian! I'd hate us to be squabbling for centuries about which hand Gerald pointed with or what he had to say about some minor aspect of something so it seems to me important we set down our history sensibly and as accurately as we can and that we pass it on to the new generations; of which I'm sure there will now be many. I'm afraid in my mind this is a subject I can't really cover in an interview question, it probably needs a whole book… guess I’m going to have to start writing one… but I'm open to debate and discussion, so hey, let's make a fire and we can all gather round and have a talk about it… for a few generations. 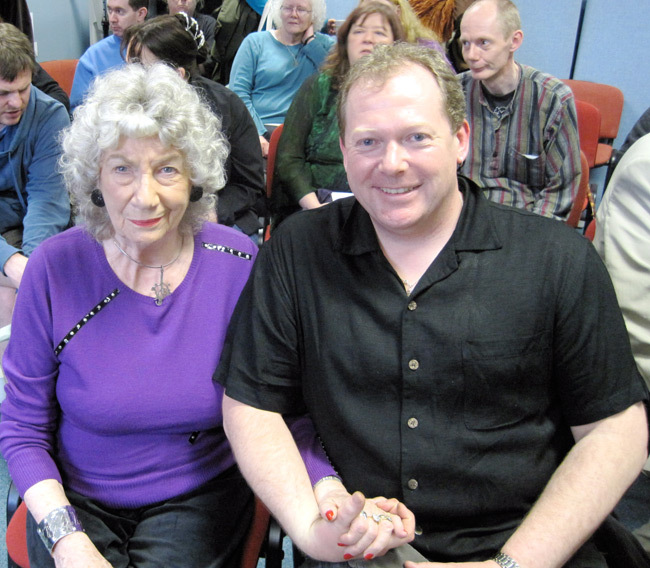 TWPT: How have you and John Belham-Payne worked together to make sure that the legacies of Doreen Valiente, Gerald Gardner or Patricia Crowther are kept safe and available to those who wish to know more about the founding of modern Wicca? AM: Well John and his wife Julie rather had Doreen's collection land upon them when Doreen was dying. She drew up her will and sent it to him and he was amazed to read that she anted him to have all of her magical possessions. He asked why she wanted to give it to him and one of the things she said was that he was "the only bugger who never asked her for anything" and that she was sure he would “do the right thing with it” but she didn’t say what she thought the “right thing” was. I met John when he was giving a talk at a conference about Doreen and I was caught up in his plight, he didn't really know what the “right thing” actually was and Doreen had been very enigmatic with him on the subject, all he knew was that the legacy needed protection and he felt it truly and spiritually belonged to the pagan community that it symbolised. I felt for him and introduced myself and casually (but sincerely) offered him my help and that was that, the conference ended, we all went home and nothing happened for over a years and then one night, out of the blue, he rang me up and asked if I remembered him (!) and if I remembered offering to help! He said "you might come to regret making me that offer!" but I absolutely haven't, I can assure you! We realised the safest thing to preserve the collection was to put it into a charitable trust so it is owned, effectively, by the public. In private hands there is the awful worry of who to leave it to when you pass on and the fear of all sorts of things happening to it (temptations becoming too great to sell it, especially a few generations down the line or it being a personal asset that could be seized if its owner fell into debt etc. etc.) and we realised that if we set the trust’s rules up properly we could protect it forever from being sold off or split up or neglected. We also figured that it was no good if the public who owned it couldn't benefit from it so we also wrote into the rules of the trust that the trustees had a duty to research into it and share their findings and make the collection “accessible” to the public who now own it. We think the best way to do that is by exhibition and building some kind of a museum around it for that purpose. I think it was a massive thing for John to give it all away (albeit to a carefully formed trust of which he was to be one of the trustees) but we believe Doreen would have been delighted (she probably thought of it all along). For a while John was very weighed down by the decision of what to do and we often shared some black humour about the parallels with Bilbo, Frodo and The One Ring (which is my slightly irreverent nickname for Gerald's old Book Of Shadows which is part of the collection). I think we've realised that while Doreen's collection is the most famous one in the world (and it contains many things Gerald and others gave her too) there are other people out there who are faced with the same dilemma over the pagan heritage that they own. We hope we can be seen as a possible solution to this and are we taking pledges and promises even now about other famous witches' collections. The museum process is slow, we need funding and we need premises and both are packed with obstacles and red tape so while this difficult process drags on we are out and about giving talks and lectures and taking parts of the collection with us as travelling and temporary exhibitions so that people can come and learn and see. Our fellow trustees include John's wife Julie who was also Doreen's friend and carer in her last days, Rufus Harrington and Professor Ronald Hutton and also the likes of Philip Heselton and other well known pagans and witches being close and firm supporters, advisors and helpers not to mention the fantastic support of our Foundation members and the rest of the pagan community. We have carved out a good chance of achieving our aims and making Doreen and Gerald's legacy as embodied in their possessions and writings something that future generations will be able to benefit from properly. Additionally of course the Craft itself gets stronger, the initiatory system is still working and it too has great support around it from a massive host of people associating with it and finding their own spiritual paths for themselves whether they become initiates or not so I feel very much part of the whole thing and very grateful to have a chance to shoulder some of that responsibility as a trustee, an initiate and as a human being to push things forward. TWPT: What is the Centre for Pagan Studies and what kind of role do you play in this organization? Why is there a need for more groups such as this? AM: The Centre For Pagan Studies began back in the 1980s/90s when John & Julie attended some "workshops" and events designed to teach people about the magical arts and thought, "well that's not right" or "that's hogwash!". They didn’t like people charging high prices for inaccurate or scant knowledge (one of the principles of the initiated craft is that you don’t charge for teaching the craft) They thought they could do better themselves and in a way that wasn't so money orientated. They owned premises suitable for hosting talks and lectures and they started to put on events and activities for themselves. One day Doreen Valiente showed up much to John and Julie's surprise! They were even more taken aback when she contacted them and told them she liked what they were doing and she wanted to "get more involved”! I'll let John tell you the story of this meeting at a later date but the upshot was that she became the CFPS's patron and gave talks there herself. When John and Julie moved to Spain after Doreen passed on the CFPS became a more ethereal entity, dedicated to accurate information and history and basically fulfilling all the practical functions of what the Foundation now wants to achieve. We decided to create the Foundation as a separate legal entity that "owns" (in trust) the collection and have the CFPS as the more active organiser of events, talks, exhibitions, publisher of books etc. etc. Both the DVF and the CFPS are charitable and not-for-profit organisations so titles are a trustee of the Foundation and a guarantor and Director of the CFPS. In practice this basically means that with John and Julie we run the organisations, we do all the admin, take the responsibilities and decisions and do the work really for which we rope in our supporters to help us! Everyone gives up a lot of time to do this, no one gets anything financial out of it but we all believe we are doing “the right thing” and that knowledge makes it all worthwhile. Why do we need groups such as this? I think the need justifies the group, we have a fairly clear aim and a cause and since we hold some standing in the pagan community built on Doreen’s reputation as well as our actions since her passing. I think there are many other parts of the pagan community with issues that need people willing to give up their time and volunteer their skills, resources and passions into things and we want to link up with them, like the Pagan Federation to further the wider aims of paganism - no group is an island, we all need each other! TWPT: What kind of support has been shown for your efforts from the pagan community both in the UK and abroad? Do you think that the community understands the importance of preserving and recognizing where it was that we came from? AM: The community of pagans is very broad and prizes individuality, if you asked 1000 pagans what they believed you’d get 2,000 different answers! The pagan community seems to rather revel in this actually, but it certainly knows where its roots are, you mention Doreen or Gerald and it automatically triggers an instant acknowledgement and a respect though we know we need to keep the new generations informed about their roots to keep this up. Even among those who don't see their tradition or path as lying especially close to that of the Wica people can recognise and understand that the pioneers in the field did a great deal indeed for pagans of all paths and we certainly wouldn’t be in as good a position as we are today without them. Doreen is so deeply loved by everyone, we're very conscious of not portraying her as some sort of saint but its true that she was (and remains) a figure characterised by tolerance, an ability to listen and a kind and accommodating spirit, all underpinned with a deep knowledge and a gift for being able to share it without elitism or condescension. You see, there I go, I think I've just inadvertently described "St Doreen Of The Wica"! So it follows on from this that we've been accorded great support and respect, campaigns like the Blue Plaques are a very visible way of sharing in our heritage and people feeling involved. On a personal level I've been meeting people who I grew up reading the books of, sort of pagan celebs really, and I’ve found they have been wonderfully warm and understanding to me, I've got to say that giving a talk on Doreen and the history of the craft with Philip Heselton and Patricia Crowther in the front row was somewhat. . err . . "Un-nerving”! But always I've found support and good wishes and I've always tried to be quick to admit if I don't know something or if I may be mistaken and I've been really grateful and welcoming of corrections where needed and we’ve had a lot of fun together putting on events. TWPT: Have there been any controversies that have arisen from your efforts to get recognition for the founders of Wicca? AM: Frankly speaking, no! I think perhaps with the modern pagan movement still being relatively young (70 years or so) people are more conscious of their roots. I think its a rather beautiful symmetry that some of the planet's newest religions and spiritual paths are so deeply rooted in the oldest, others might think this an irony but I disagree and I think this is partially what makes us, as modern pagans, strong. So no, no major controversies, but with Doreen being so universally liked and respected it's been possible to work to bring folks together under the banner of common opinion and respect. Perhaps if we'd been the Aliester Crowley Foundation, or even the Alex Sanders Foundation it might have been different… there you go, that will get the comments pouring in. TWPT: What effect has the age of social media had on your ability to organize and move forward on projects such as the blue plaques or on Pagan Federation agendas (or other organizations you might be affiliated with)? AM: With John and Julie in Spain, me in Nottingham and others spread about too it's been absolutely essential. We've organised things at the pre-event stage in a virtual environment but for things like the plaques or the conferences we've still really needed the "person on the ground" locally, for each event we’ve made it a priority to identify that person and then get them to agree to do it! For example for Doreen’s plaque it was Paul Pearson of Greenmantle magazine, for Gerald’s it was Merlyn of Children Of Artemis. Compared to Doreen who had to use letters, handwritten notes and who did all her research using public transport and public libraries we have it easy, John often says if she'd had the internet no one would have heard from her, she'd have been so engrossed in the research possibilities she’d never have looked up from her screen! So the lesson is probably that there's a time and a place for everything. TWPT: Do you see any downsides or ill effects that social media has had or might potentially have on the pagan community since the advent of Facebook, texting, Integra or Twitter or the many other ways to communicate instantly with all your friends and the community at large? AM: I think if it's used as a tool to communicate there SHOULD be no downsides. But there are aspects of social media that we need to be wary of, pagans tend to be rather more aware than the rest of society and, dare I say it, more naturally sceptical, so we can guard against this a bit but we can't ignore the impact of social media and so really our choices are to embrace it or miss out, happily DVF/CFPS have done the former. The problems with social media all seem to come from the ways in which people use (abuse) it. That's not to say that once Google and Facebook have collected every scrap of data available on every one of us that it won't seem so benign any more but for the moment, with caveats, it's a good servant, we just need to see it never becomes a poor master. TWPT: What do you see directly ahead for the Wiccan/Pagan community both in the short term and in the long range view as well? AM: I think that Pagans, by and large, want either to be either accepted or to be left alone, with some crossover. I think that can be achieved if the bigger organisations can be cohesive in the outward facing way we allow ourselves to be seen by those outside of paganism. The way of the modern world is for ever swifter change and development, mankind went from horseback to space travel in a few decades last century, who knows what is round the corner for humans (and the rest of the living planet) in the next 50 or 100 years or how fast it will all come upon us. So what is ahead is, I suppose, a beautiful mystery and I think all we can do is prepare ourselves to be flexible and meet whatever comes with a good heart, a true spirit and, perhaps, a bit of good organisation! Pagans need to expect the unexpected, prepare for the unpreparable and I hope, as a community, we can hold to our teachings that when things go wrong we don’t get down, we get busy. TWPT: What have been the most exciting developments in your opinion as you look at where the pagan community has come from and what is possible in the near future? AM: The answer, simply, is that we’ve fought this far to keep our future as "a beautiful mystery”! If we can continue that, the whole thing remains exciting. TWPT: Do you think that there should be more of a concerted effort to preserve the history of modern day Wicca not just in the UK but in other countries as well? Or do you think that we communities are already doing an adequate job of preserving knowledge that might be lost a couple of generations down the road? AM: I think it's every bit as important to preserve ACCURATE history as it is to preserve anything at all. We need to dispense with our imagined history, behave like proper historians and not dress up the truth about what has happened in the past, even if it can sometimes be uncomfortable. For example the idea that the craft we practice it now and that Gerald practised was just that way for centuries and that under the oppression of other authoritarian religions it resulted in millions of witches being burned to death for practicing the craft is, frankly, preposterous. This is what I mean by an "imagined history". I think it's fair to say that some sections of the really hardcode community are (rightly) very protective of their heritage but this can, perhaps, lead to a view of events that, shall we say, is less well informed by reality than it could be. Then again, if you don't get protective and pedantic, new generations come in and adopt or adapt the traditions thinking that them somehow more malleable, there are millions of people who now consider themselves “Wiccan” who are not initiates of Wicca or The Wica so there’s a fine line between evolution and convolution… or even dilution! We're very conscious that Doreen left a specific legacy and, having spent time with the collection, her possessions and her notes and manuscripts its clear to me that she did this with some purpose, she knew what she wanted to pass on and why, even if she didn't say so explicitly! I think her legacy and her "plan" for it was designed to see it shared with those who seek it in a spiritual way as well as to make it, and what it stands for and represents accessible to those looking in from the outside too. The Craft passes itself along, initiate to initiate and face to face, other pagan traditions use the same method (some don’t of course) and then, outside of this, you have the wider pagan community who have placed themselves "in the current" and looked for their own spiritual paths. Its this wider community that, while being the most susceptible to "imagined history", are really the future of things for us all, without them there would be no one to initiate into the traditions (!) so its our duty to see to it they are properly and accurately informed as possible about the heritage and history as we can make them. TWPT: Do you think that if Doreen had grown up in this “connected” generation that she would have used it as a tool just like she did her books? AM: Yes I do. And I think she'd have used it cannily as well. I think she'd have had to resist the temptation to “live online” and that may have been a challenge for her, but there would still be no substitute for proper research and I think she'd have been a bastion of accuracy and determination to get to the truth however buried it might be. TWPT: Tell me about the Doreen Valiente Foundation and what goals it has set and how it will go about accomplishing them. AM: We simply want to preserve Doreen's legacy, share it with those who are interested and make use of it to help the wider community become better informed and educated about who pagans are, what they do… and what they don't do! We think that's what Doreen had in mind for it herself and we believe all the things we do (the exhibitions and talks, the museum, the blue plaques etc.) are designed to achieve these aims. We also want to raise a flag for others to gather around, to promote tolerance and historical accuracy. We think we are on the right tracks, for instance we were part of a secret weekend meeting of pagans and christians exploring our commonality there are recent developments with the larger pagan organisations in the UK who are about to actually physically sit round a table together for the first time ever and see what we can do to develop some unity and do some good, the DVF/CFPS have been instrumental in seeing this happen and it’s very exciting . . . .
TWPT: I know that you are involved with Pagan Pride in the U.K. Could you tell me about your involvement in that event and how it has evolved since it first started? AM: Pagan Pride was born when one newcomer to the Nottingham scene organised a picnic and, to her surprise, had nearly 100 people turn up. There seemed to be a real drive to show the outside world that as a minority community Pagans are strong together, no threat to society and not afraid to identify themselves as pagans, the phrase "Pagan Pride" really sums this up. So it became a parade through the streets of the city and we had to approach the council and learn and obey the rules about how to organise such a thing within the law (and with proper insurance and safety etc.). I got involved because I wanted to have the CFPS/DVF and the Pagan Federation represented . . . within a year I was on the organising team and now I have several roles from media relations to building the website to taking responsibility for traffic management when we bring Nottingham to a standstill. 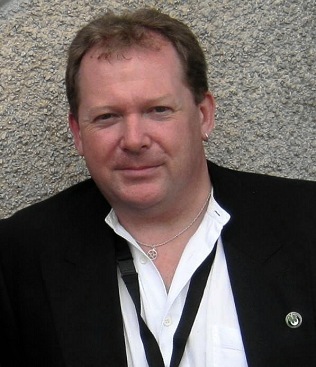 I also drive the van and work the sound desk at the fundraising events… I even sang once too! Pagan Pride has grown to become the UK's biggest free pagan festival, that's the key ethos: it's FREE - so all the speakers, musicians, bands etc. perform for free and the whole thing is staffed entirely by volunteers, the things we have to pay for like insurance etc. are paid out of funds raised by putting on other smaller events during the year and the sale of t-shirts and other merchandise. It's still hoped that Pagan Pride (and the other Pagan Pride groups across the world might unite and one day we could perhaps hold a global Pagan Pride day… well, we can but dream… though I now know quite a few people who know how to make dreams happen… comes with the territory I guess! TWPT: Tell me about your involvement in the Nottingham Pagan Network. What ‘s it about and how has it brought pagans together? AM: NPN is a very local group to Nottingham, started as a more social event (a “moot”) It filled a gap in the market really, there were only organised monthly talks by groups like Nottingham Empyrean and this was quite a while before Pagan Pride hit the scene. I first attended it because it was being held at a good pub but I was only one of about 5 people. A rather pretty girl was apparently about to take over the reigns as organiser and over the 4 years or so she's been doing it since the monthly moot has grown from 3 or 4 people to an average of about 25 and sometimes over 60! Sarah worked really hard to achieve this but perhaps hasn’t had quite the reward she deserved because as well as creating a model moot that's become so successful through of her dedication and great organising skills she somehow also became my girlfriend! Seriously though, the Pagan community owes its existence to people like Sarah, people who see traditions, however modern, and refuse to let them die out and who see people seeking something and a need to raise a banner so they can find it and others interested in it too. These are people who throw their lives at their causes give up hours and hours and work really really hard behind the scenes often with no reward to facilitate involvement in the community by everyone else. Sarah also does a lot behind the scenes for the DVF and the Centre For Pagan Studies. Actually we (CFPS) started a scheme for handing out outstanding achievement certificates to people who had done great service to the Pagan community but we kind of got caught up in other things, I'd really like to pick this back up again, I feel a bit inspired thinking about all those unsung heroes out there! TWPT: And now for an open ended question that will give you an opportunity to express your thoughts about anything that I didn’t cover in my questions but is important enough that you would like to talk about it here. The floor is yours Ashley. AM: Wow, where do I start? As you'll have gathered I can talk a charging bull to a standstill at 50 paces but, as ever, I feel like I've only scratched the surface.... I know now (thanks to John) that I have a calling to give something back to paganism, and that while my positions may thrust me in front of people much of what I shall spend my life doing will be behind the scenes stuff, working on the boring things that organisers do, I get a kick out of things like starting up the publishing arm of CFPS, there's something thrilling about seeing your work in print, albeit my role in Doreen's two books released so far has been as editor, designer and layout artist. So sure I get the good jobs too, it's such an honour and a pleasure to give a talk and exhibit the artefacts from the collection but what lights me up is that we’re all working together to do something for the future generations of pagans, being part of that is reward enough. On a totally personal level what I REALLY want to say is that I'd LOVE to talk with EVERYONE somehow, if you see me out and about at talks or events or whatever, I'm usually running around looking too busy organising things to stop but just give me a smile or a wink and if you can actually stop me for a second you can gently remind me to look up at the sky occasionally and remember exactly who I am… that would be great… see you out there somewhere soon I hope. TWPT: I thank you Ashley for taking the time to answer my questions and I also thank you for giving the questions some serious attention which shows in the answers you sent back to me. Interviews can at times become just another repetitious thing that community leaders and authors “have” to do and it is always apparent as I read through the answers as to how much time was spent considering the questions before answering. I appreciate your efforts in giving the readership of TWPT something of substance to chew on as they read through this interview. Best of luck with all your efforts in the U.K. and may they have repercussions around the world.